Along with being the leader in ice fishing products, Clam Outdoors offers utility trailers and carts with its Polar Trailer™ products, Quick-Set™ screen shelters and Bigtooth Tackle™ muskie baits. For over 30 years Clam Outdoors has stood for the best in outdoor gear. Quality is our top priority at Clam, and it’s reflected in everything we make. 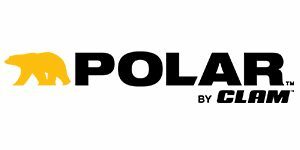 For more information on Polar by Clam, visit www.clamoutdoors.com and follow Social on Facebook, Twitter and Instagram.